Hornung, V. et al. 5'-Triphosphate RNA is the ligand for RIG-I. Science, 2016, 314, 994-997. Wang, Y. et al. The autoimmunity-associated gene PTPN22 potentiates toll-like receptor-driven, type 1 interferon-dependent immunity. Immunity, 2013, 39, 111-122. Chen, W. et al. Induction of Siglec-G by RNA viruses inhibits the innate immune response by promoting RIG-I degradation. Cell, 2013, 152, 467-478. Wang, P., Xu, J., Wang, Y. & Cao, X. An interferon-independent lncRNA promotes viral replication by modulating cellular metabolism. Science, 2017, 358, 1051-1055. Viral infection is one of the major threats for human health nowadays. However, the under lying mechanism of viral infection, especially how viruses hijack host cell metabolic network for their replication, is still largely unknown. Through screening transcriptome of host cell, we identified a group of noncoding RNA induced by virus infection via an interferon independent manner, of which an lncRNA, named lncRNA-ACOD1 by us, is vital for virus replication. lncRNA-ACOD1 interacts with a key metabolic enzyme, aminotransferase GOT2, to promote its catalytic activity to produce more metabolites as the material of viral replication. 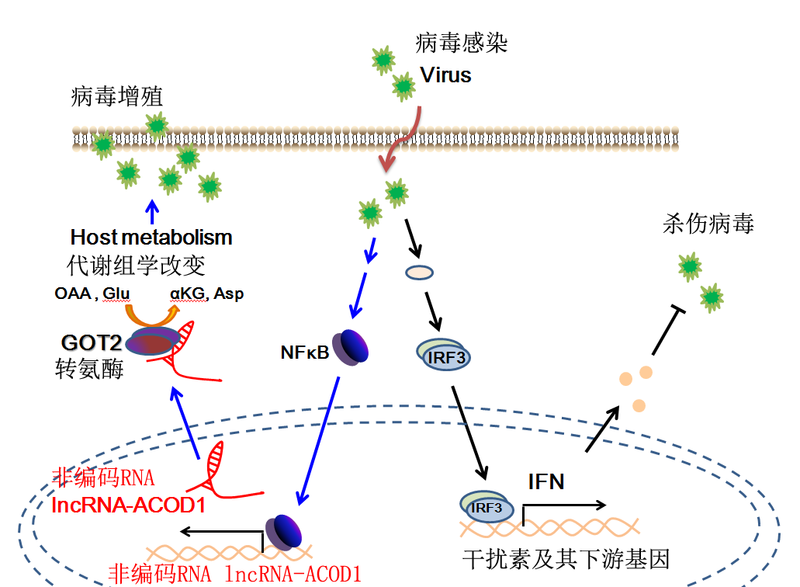 LncRNA-ACOD1 expression is NF-κB dependent while its expression and function is interferon/IRF3 independent, which is an alternative pathway of virus infection regulation. This study provides an attractive new drug target for the treatment of viral infection diseases and also opens a new field for studying metabolic regulation and noncoding RNA function in viral infection.